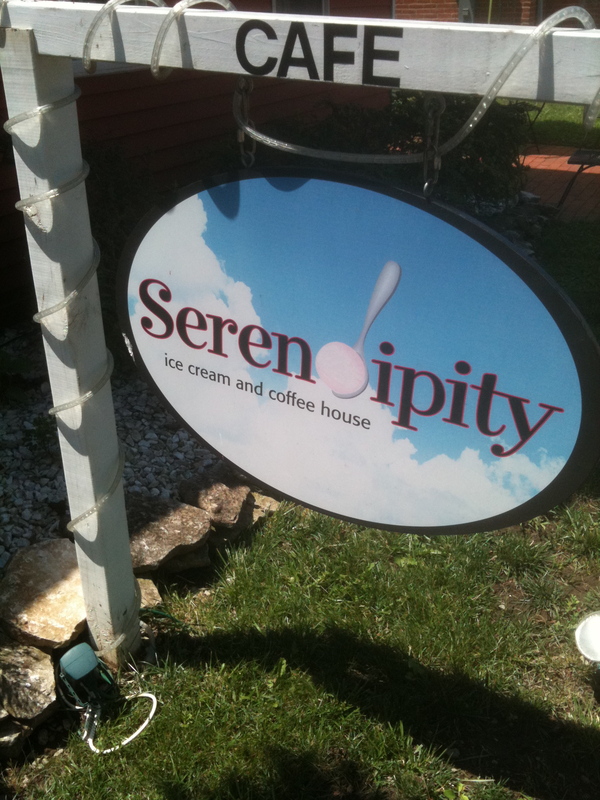 I found a place that serves both coffee and ice cream, its name is Serendipity and that is how I found it. I was roaming around Westerville and just happened to walk by the place after eating. I saw Ice cream and coffee together in one place and knew I had to go in. Serendipity is located in an old house on East College Ave in downtown Westerville. It blends in with the neighborhood including the gazebo style dual swing in the front yard – it is great for rocking in. In the inside – there is an ice cream counter dipping Ashby’s ice cream, a full service coffee shop and a small selection of baked goods, sandwiches, paninis and other foods. Ice Cream and coffee were made for each other which makes Serendipity special. What makes it extra special is the cozy college coffee house feel it creates. The house is full of comfortable couches and chairs, plenty of reading material, games, free Wi-Fi, superior bathrooms and anything else you would need to camp out for one to twelve hours. I was too full to sample anything other than the friendly service but I know I will be back very soon. This entry was posted on July 7, 2011 at 2:41 PM	and is filed under desserts, ice cream. Tagged: Serendipity Ice Cream and Coffee House. You can follow any responses to this entry through the RSS 2.0 feed. You can leave a response, or trackback from your own site.